Most of us have admired a Tudor garden which often accompanies a great Tudor House or Palace. It is only when you start looking into the history of early Tudor gardens, that you learn that what is being sold to us as a Tudor garden is actually only the Victorian or early 20th century perception of what a Tudor garden is, yet it is far removed from what Henry VIII or his contemporaries would have recognised. 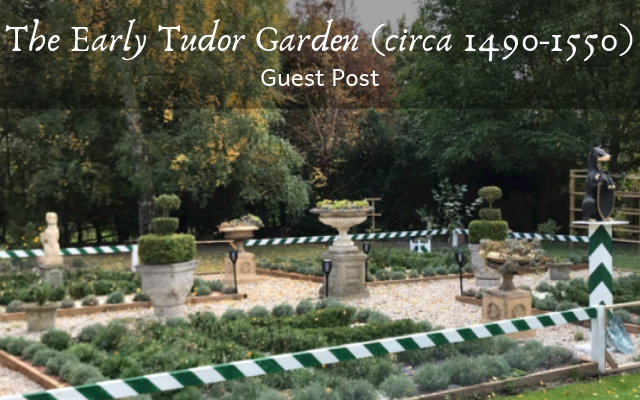 I am a keen gardener with a deep passion for all things Tudor and so back in 2016 I set out to re-create an authentic early Tudor garden with time authentic planting and design. 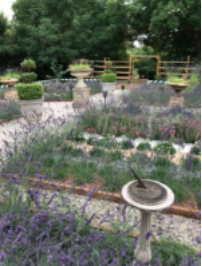 The Early Tudor gardens are without any doubt, inspired by the Italian Renaissance and the French formal gardens of the 15th & 16th century. Henry himself saw himself as England’s first Renaissance man and luckily there is plenty of primary source on Italian renaissance gardens at hand. The Italian garden is identified by its symmetrical plantings that follow a sight line from a villa and contain sculptural programs and waterworks. By contrast, the French formal gardens ( Chateau de Fontainebleau) often denote a more grandiose and planar garden type with a greater emphasis on the arrangement of floral parterres ( the word has not come to England until the 17th century ) than creating architectural harmony. The Renaissance ideas reached Britain as early as the 15th century. One of the most significant elements was the innovative idea of relating the garden to the house and vice versa. Renaissance gardens were designed to enhance and complement the architecture of the house. Formal lines ad simple geometric shapes dominated and structure was provided. 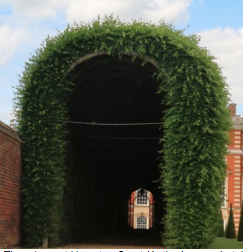 This applied to hard features such as paths, walls, pools, statues and soft architecture such as hedges and topiary. An English device distinct from any Italian Renaissance influence was the use of brightly coloured heraldic features repeated regularly throughout the garden. 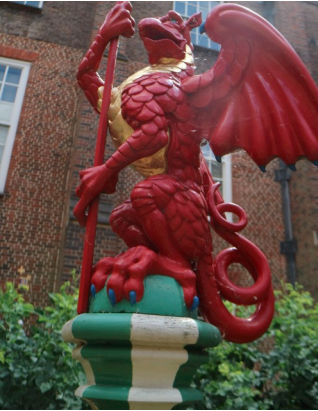 Where the Italians and the French used stoneware and statuary, the English monarch favoured timber posts with the tops of carved beasts like lions, horses, and dragons, each one brightly coloured and topped with a small flag that often depicted the Tudor Rose. 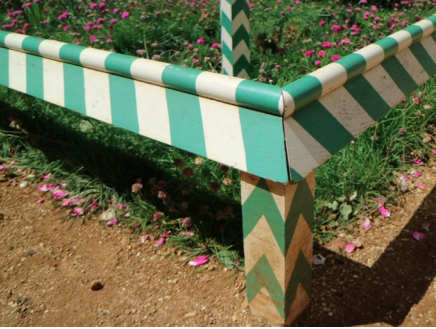 Between each post ran wooden rails, painted in the Tudor colours of green and white. Henry VIII’s garden never attained the symmetrical perfection of European kings but was instead filled with an array of buildings, sundials and heraldic beasts in glorious, gaudy colour. Arbours were also known as “roosting places” and the word meant “harbour”. They were made of trees with intertwined branches or impermanent trellis-work covered with creeping plants and honeysuckle. Chaucer already mentions arbours (“herber”) and also a turf seat. Turf seats were sometimes built against a wall, or round a tree. The arms were brick or stone and the seat, though faced with stone, was earth raised a foot or 18 inches from the ground and turfed over with sweet-smelling herbs such as camomile, penny royal or grass. The earliest use of the word “knot” in relation to gardens occurs around 1500. The OED cities the following reference from 1502 : “ For diligence in making knottes in the Duke’s garden. Clypping of knottes, and sweeping the said garden “. 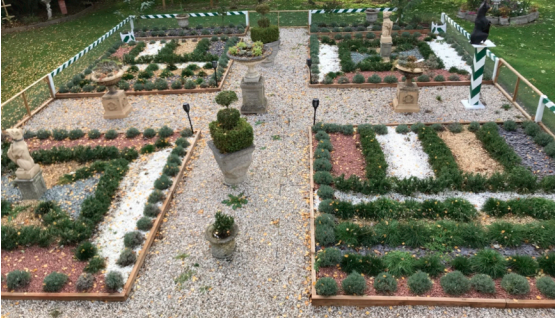 It was during the early Tudor period, that “ground patterns’ created by low hedges were used to create “knot gardens”, “foot mazes” and labyrinths. 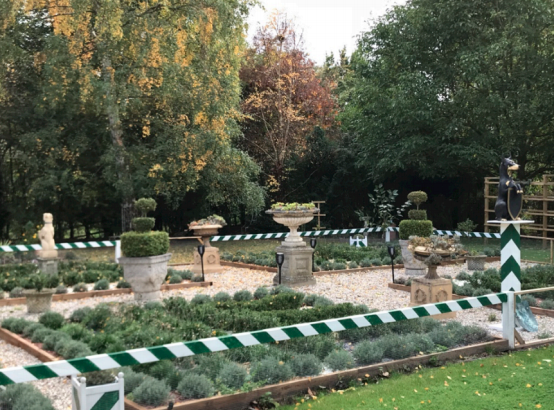 Symmetry and geometry were highly favoured, as well as the use of topiary and evergreen plants. From the 15th century, Italian architects became increasingly concerned with the organisation of the garden area and they started to divide the garden into harmonious “compartiments”. This Renaissance tradition then spread to England by the middle of the 16th century, where these “compartiments” were known as “plots” , “quarters” or “squares”. Such a quarter referred to a subdivision of a garden and not necessarily referred to a 4th of it, nor specifically a square shape. The usual size of quarters containing a single knot is in the range of 35 to 70 feet. 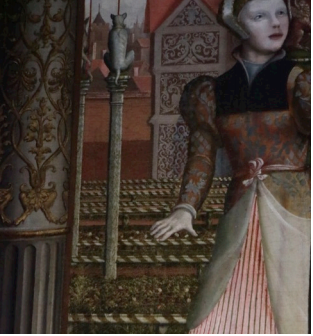 From about 1538, fruit trees ( apples, pears, peaches, cherries, plums ) were planted just within the hedge or alternatively the fruit trees could be set in the hedge line as it was the case in 1535, at the Grand Jardin at Fontainebleau. The edging was created with woody, scented herbs such as English lavender, cotton lavender, hyssop, thrift, marjoram, germander, savory and thyme, were popularly recommended by authors such as Thomas Hill and John Parkinson,but never box. As late as in 1600, box was still described by the writer Richard Surfleet as “ of naughtie smell” and was said to kill bees and “corrupteth the aire”, being an ill choice for the knot garden. ( According to John Parkinson, dwarf box was only becoming available into the gardens as late as 1629. ) In 1568, Thomas Hill refers to thrift as the much favourite plant in the past. The popular design was the “quartered” garden of four knots, surrounded by fruit trees with the addition of a central feature such as a fountain or basin. Tudors had always had a fascination with the new and the rare and most especially the edible. Apricots known as “apricocks” were brought to England from Italy by Henry VIII’s gardener in 1542 but were still little known in 1548 when William Turner published his “Names of Herbes”. By 1515 Turner noted “many in Almany (=Germany) and some in England. In 1530, Hampton Court accounts list strawberries, primrose, violets, sweet Williams and gillyflowers. The royal gardens at Richmond (no longer exist) created by Henry VII, were noted in 1501 as having many vines, seeds and strange fruit, royal knots, orchards, bowling greens and houses of pleasure with chess tables, dice, cards and billiards, alleyed and herbed with many marvellous beasts as lions and dragons and such other diverse. On the south side of the inner ward is a proper garden, and about the same a goodly gallery conveying above and beneath from the principal lodgings, both to the chapel and the parish church. The utter (outer) part of the said gallery being of stone, embattled, and the inner part of timber covered with slate. On the east side of the said castle or manor, is a goodly garden to walk in, closed with high walls embattled. The conveyance thither is by the gallery above and beneath and by other privy ways. Beside the same privy garden is a large and goodly orchard, full of young graffs (grafts) well loaden with fruit, many roses and other pleasures. And in the said orchard are many goodly alleys to walk in openly. 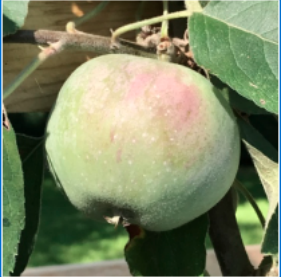 And round about the same orchard …. (are) other goodly alleys with roosting places (=arbours, meaning “harbour”) covered thoroughly with white thorn and hasel. 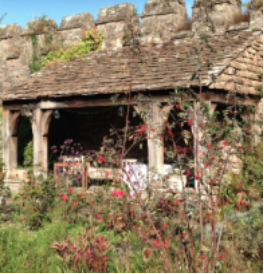 At Thornbury, the walls were crenelated and the solid stone or brick wall formed one side of the gallery. It seems to have had its inner side covered with slates. 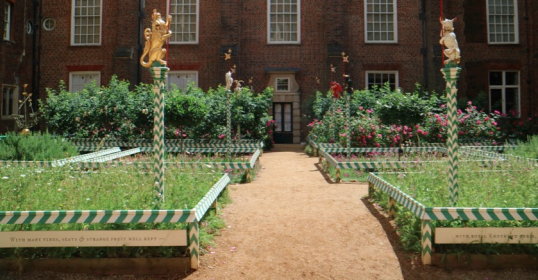 Whitehall Palace had a privy garden of some 120 metres by 75m containing raised beds of red brick with planting retained by wooden rails in green and white. Sadly this garden no longer exists. “My garden sweet, enclosed with walles strong… the knots so enknotted it cannot be express’t with arbours and alyes so pleasant and so dulce” – William Cavendish circa 1520, describing Hampton Court. Hampton Court as extensively changed by Cardinal Wolsey and Henry VIII. No plans have survived. Wolsey apparently kept part of the medieval old manor house garden. Until 1529, when Henry took over Hampton Court the head gardener’s name was John Chapman at a salary of £12 a year. Heraldic beasts also appeared in Hampton Court. In 1534, the king’s account records that Edward More of Kingston was paid 20 Shillings a piece for carving 159 of the “kinges beastes”. The accounts refer to lions, greyhounds, dragons, hinds, antelopes, griffins, leopards, tigers, harts and badgers – some of which bore “shields with the kings arms and the queens. Some at least of this astounding array of figures appear in the Wyngaerde sketch of Hampton Court. 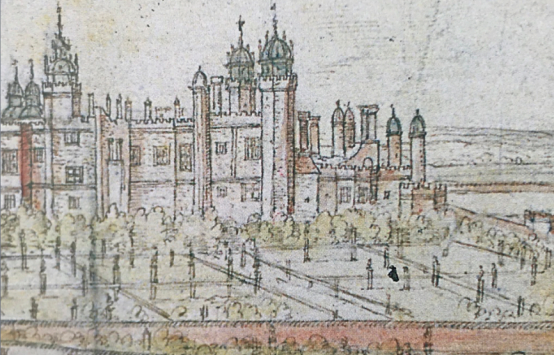 Another important feature at Hampton Court was the mount, which was built in 1533. It provided elevated views and was densely planted with hawthorn & three pear trees and featured an arbour at the top as well as the king’s beasts. At Hampton Court there was also a great orchard which contained apple, pear, 600 cherry trees and service-berry trees. We also find “gooseberry” or “Groserbush” which now seem fairly common and have been at Hampton Court since 1516. Turner says that they have come from Germany. Tudor apple varieties still available through specialist nurseries are Winter Pearmain, Green Custard, Catshead, Pippin, English Codlin, Winter Queening and many more. 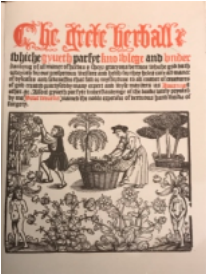 Tudor gardens were highly regarded as a place for meditation, recreation, exercise and usefulness in supplying the household with fruit, vegetables, herbs and flowers and provide the family with food and medication. • “A new herbal” published in 1551, the first herbal written in English to reflect its non-monastic origins. 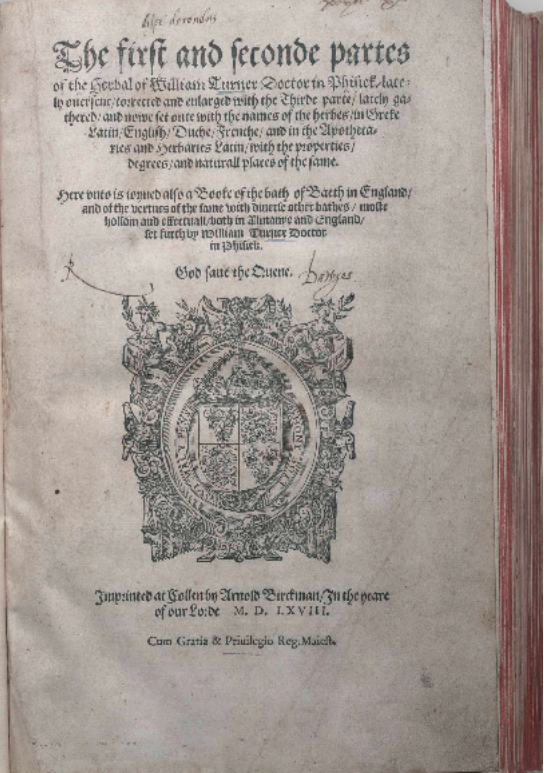 The second part was published in 1562 ( religious exile on the continent) and the third and final volume in 1558. Turner had compiled his own list of 238 plants. From this list sprang his book. His patron and employer was the Duke of Somerset at Syon. He later became the Dean of Wells Cathedral and is often referred to as the “father of English botany”. He does not give any advice on gardening. • “Libellous de re herbaria novus“ published in 1538. This is the only book he published in Latin. JOHN SKELTON: in Garlande of Laurell : rosemary, gentle ( meant cultivated, not wild ) marjoram, primrose, columbine. THOMAS PHILIPPS: marjoram, columbine, daisies, gilliflowers, camomile, borage, savory, lavender, primroses and violets. Hyssop, purple iris, holly-hock, columbine, wallflower, English lavender, daffodil, primrose, roses ( rosa gallica, rosa alba, sweet briar ), sweet violet, white lupin, yellow lupin, rose campion, sweet rocket, honesty, pot marigold, Christmas rose, peony, poppy, saffron crocus, carnations (pinks), foxgloves, borage, English bluebells and many more. Snowdrops, snapdragon, red-flowered daisy, plumed cockscomb, cornflower, curry plant, spike lavender, French lavender, cotton lavender, Jacob’s ladder, turkscap lily, African marigold, nasturtium, rock rose, cyclamen, Spanish dagger, cornelian cherry, apricot and several more.